Well, as promised, here are some early impressions from the time I spent looking around our Platte River Prairies with Mike Arduser (bees) and James Trager (ants) last week. I’ll know a lot more after Mike and James have time to sort through the all the insects we collected. Both have promised to send me annotated lists of the species we found, along with the locations each was found in. Once I get that information, the three of us will be able to have some more discussions about what the data tell us about the state of our prairies – from the perspective of bees and ants. It’s unlikely that our single snapshot of data collection will provide us with any major conclusions, but I have high hopes that our efforts will point out some paths I can follow during the next couple of years to flesh out the story. Obviously, plant diversity is important to bees, but the majority of bee activity last week seemed to be taking place on purple prairie clover, a species that is pretty abundant in both our remnant and restored prairies. I don’t know yet how many of the 40 or so bee species we collected were found (at least once) on prairie clover, but I bet it was at least 30%. In addition to purple prairie clover, hoary vervain was another fairly heavily used species (though nothing like the clover). In some ways, then, a few very accessible and productive flowering species seem to play a huge role in supporting bees – especially generalist species – in our prairies during this time of year. From talking with Mike, it sounds like that kind of heavy use of a few species is fairly common in other prairies he’s seen. Mike Arduser peers intently at a patch of silky prairie clover, hoping to find bees that specialize on that plant species. On the other side of the coin, roughly half of the bee species in our prairies (and most other prairies, I think) are specialist pollinators on a single species, or small group of species of flower. For these bees, the abundance and distribution of their particular host plants is obviously critical. We found bees that specialize on a number of different flowers, including those in the genera Callirhoe (poppy mallow), Physalis (Ground cherry), and Oenothera (evening primrose), among others. There were also a fair number of bees with slightly broader, but still restricted, diets. Many of the flowers used by specialist bees have other pollinators to help them produce seed, so the relationship is usually more critical to the bees than the flowers – though that’s not universally true. Some, like the ground cherries, have flower types that can’t easily be pollinated by insects other than those built to specialize on them. I took this photo a couple weeks before Mike and James arrived. Mike and I found it again – and some more like it – and he figured out that it’s the nest of a bee that specializes on poppy mallow flowers. 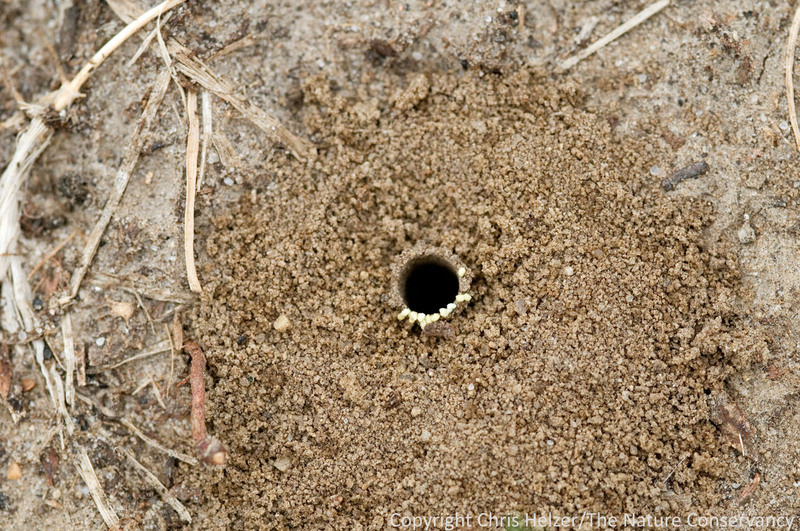 The yellow pollen grains around the rim of the hole are commonly seen – but no one knows for sure what they’re for. Mike and I spent some time talking about our need to know more about what thresholds of flower abundance and distribution are really important for these specialist bees. For example, a prairie that has only a couple individual plants of ground cherry isn’t likely to be able to support a bee species that can only use that kind of plant. But how many plants does an individual bee need to raise a brood? And how close together do those plants need to be in order for bees to find and pollinate them efficiently? From the plant species’ standpoint, how many individual plants (and at what density?) does it take to attract enough pollinators to provide sufficient pollination for the plant population? It’s a particularly important question when talking about rare plants, which often occur in small scattered populations. It’s also important for our degraded remnant prairies that have very few individuals of even some more common plant species. If we don’t have enough plants to garner effective pollination, the population may not reproduce – or sustain itself in the prairie. It makes me think about the way we approach our overseeding efforts in those degraded prairies. Maybe we need to be using lots of seed in small areas to establish patches of flowers with enough density to attract pollinators, rather than spreading that seed more lightly across large areas. Very thought provoking. I need do some investigation, and see whether we’re getting seed production from plants that are scattered at low densities across degraded remnant prairies. Mike needs to spend some more time looking at the data we collected this week to see if there are differences in the bee communities between our restored and remnant prairies. We spent quite a bit of effort collecting bees from purple prairie clover and hoary vervain across a range of restored and remnant sites in the hope that we could see whether or not the same bee species were visiting the flowers in both site types. Granted, we only had about three good days of field data collection to draw conclusions from, but I hope it was enough to give us at least an initial glance at what’s going on. To do it right, of course, we’d need to look at the abundance and density of plants at each site, and focus on more than just the number of bee species using them at each site – the number of total daily visits, for example, would also be important, as would seed production and other measures. I’m hoping to collect some more bees throughout the rest of this season to give us a bigger slice of the total picture to look at. It’d be great to see a pattern interesting enough that we can build a graduate student project out of this, and take a much closer look at what’s happening. Anyone looking for a good project? We saw a lot of bees on prairie clovers last week. 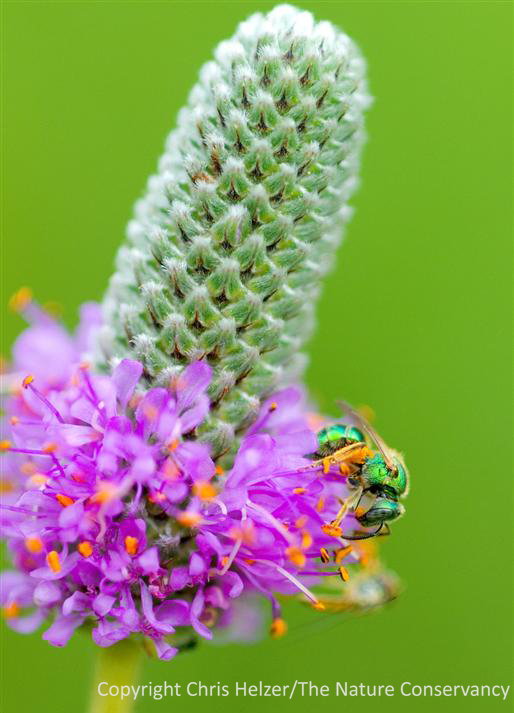 This green sweat bee was not photographed during the week – and interestingly, we saw relatively few green sweat bees in our prairies last week. Again, Mike still needs to finish sorting through and identifying the bees we collected this week. However, he did notice a few interesting discrepancies between what he expected to see at our sites and what we actually found. For example, we really didn’t see many (any?) twig-nesting bees, and only two species of parasitic bees. At this point, it’s hard to know if that’s because the bee fauna here is just different than what he’s used to seeing further east, if our sample was too small to fairly represent what’s actually here, or if there’s something functionally missing from our prairies. On the other hand, there were a fair number of bee species that are rare in Missouri and other eastern prairie states, but common in our prairies here. One of those is often called the “ghost bee” because of its fuzzy white appearance and the difficulty of finding it in eastern tallgrass prairie. When Mike saw one in my net on our first day of sampling, I could tell from his expression that it wasn’t just another fuzzy bee… Unfortunately, after I came home that night and bragged to my family (who didn’t seem that excited) that I’d caught the elusive ghost bee, we ended up seeing them pretty often during the rest of the week – somewhat dampening my sense of accomplishment. And, just to rub it in further, during our public field day on Friday, two Pheasants Forever biologists showed Mike some very nice photos they’d taken of the same bee species from another prairie about an hour north of us. Sure, it’s great to know that the species appears to be doing well in this part of the world, but it did knock the air out of my balloon a little… On the other hand, how great is it that there are Pheasants Forever biologists out taking photos of bees in prairies?! Awesome. 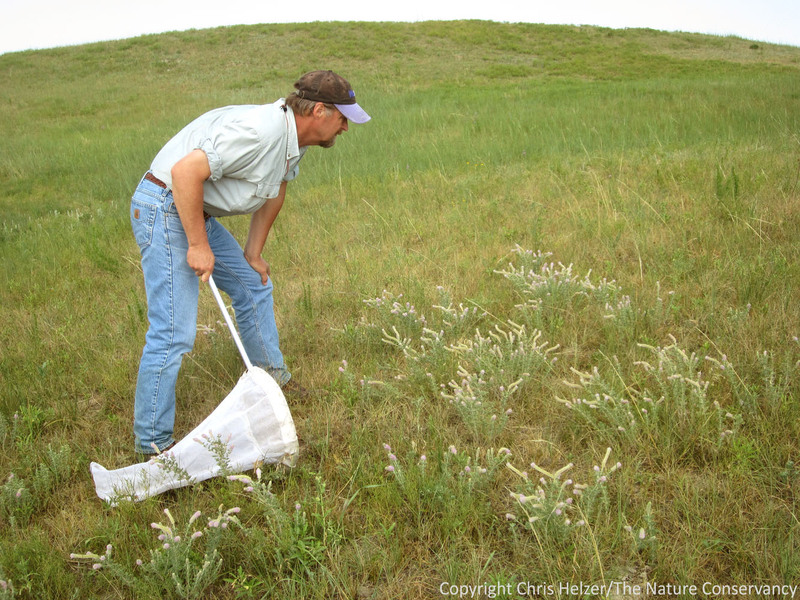 It turns out that ants provide an interesting contrast to bees in terms of how they perceive prairie “quality”. While the diversity and abundance of bees in a prairie is heavily dependent on the diversity of flower plants, ants tend to look more at habitat structure than at plant species. For example, James says that one very important attribute of prairies is the attractiveness of its habitat for recently-mated females looking for a place to start a new colony. One significant factor for those females is the presence of enough bare ground to allow them to see whether or not an area is already occupied by colonies of potential competitors. More broadly, prairies that are most attractive to ants tend to be those that have a lot of variation in plant density and structure. Prairies that are dominated mainly by grasses are usually too homogenous to be very ant-friendly. 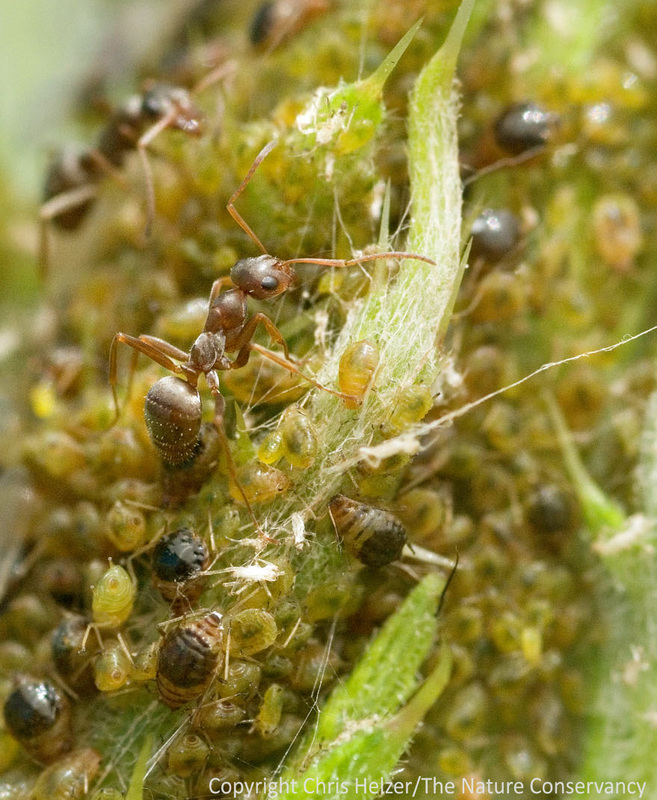 So, while ants might not respond directly to plant diversity, prairies with good plant diversity may be more likely to have the kind of structural diversity that ants are looking for. After seeing the kind of fire and grazing management we’re using on our sites, James’ opinion was that we’re probably doing a pretty good job of facilitating ant habitat. Our grazing helps create the kind of structural variation that ants tend to like, and our stocking rates are light enough that we aren’t likely to be compacting the soil to the extent that it might negatively impact them. However, as with Mike, James only had a few days to look at our prairies and the ants living there, so it’s hard to draw too many conclusions – and he still needs to finish sorting and analyzing the data we collected this week. 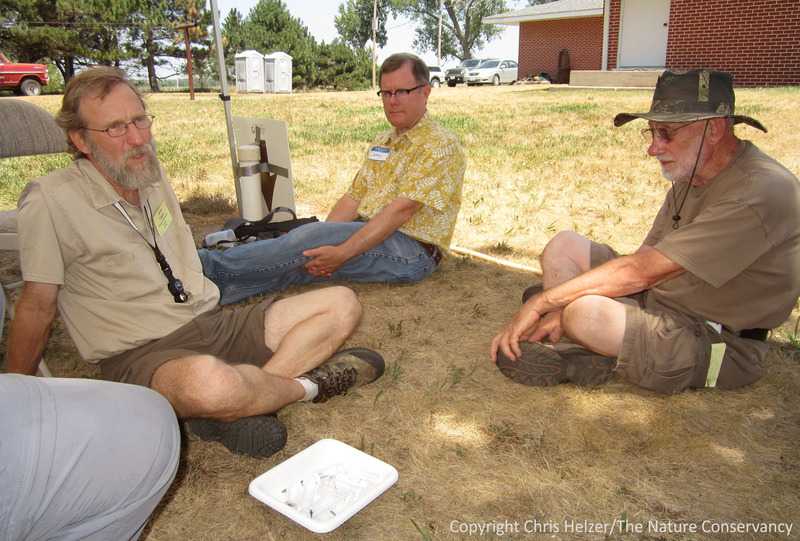 James Trager (left) sits under a tent discussin ants and other insects with visitors during our Platte River Prairies Field Day last Friday. Because of the limited time we had, and the great variation in management and soil types across our prairies (not to mention this summer’s drought) it wasn’t really possible to do a good direct comparison of the ant communities between our remnant and restored prairies. However, I hope that James’ data might still give us some hints about whether or not there is something to follow up on in that regard. Because I know our restored prairies have some soil characteristics that are pretty different from remnant prairies that haven’t been farmed, I expect there to be some differences. Whether or not they’re important differences – or correctable – is something I don’t know…yet. I’m extremely grateful to both Mike and James – as well as Laura – for giving up an entire week of their time to come out to explore our prairies and help me learn to think differently about them. As always happens when I spend time with intelligent people who are experts in their particular subject matter, I was awed both by their level of knowledge and the complexity of the worlds they study. Everywhere we looked, Mike and James shared fascinating stories about nearly every insect that flew or crawled by. In addition, both were very knowledgeable about ecology in general, which led to fantastic discussions about much broader topics than just invertebrates. It was a week that will keep my brain buzzing for a very long time, and I can’t thank them enough for coming.